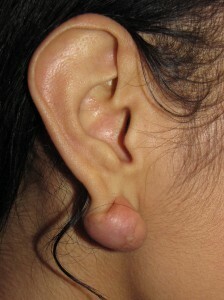 Keloids of the earlobe would not as common as they are if it weren’t for the widespread popularity of piercings in both women and men. In fact, virtually all of earlobe keloids that I have treated in my plastic surgery practice over the years have developed as a consequence to issues with piercings. Furthermore, though the risk is far higher in darker complected individuals, particularly blacks, I have seen them effectively in all races – Hispanic, Native American, Asian-American, Middle Eastern and those of European descent – even fair skinned English and Irish. But, I have never seen an albino with a keloid. And never will. Because, quite interestingly, albinos do not form them. The exact reason for this, though, is not well understood. Keloids of the earlobe, as is also true when other areas of the body are involved, need to be treated completely – not just with one modality. And, there needs to be long term, fairly regular follow-up. The reasons for this are related to a high risk for regrowth and recurrence when there is inadequate care and/or absence of long term monitoring. Far too many people who see me in consultation for their large, recurrent keloids initially underwent treatment elsewhere for growths that started out much smaller in size. The approach that I most often employ for my patients is a combination of surgical excision, reconstruction of the earlobe and the immediate injection of a steroid medication into the site (which helps to significantly reduce the incidence of recurrence/regrowth). A topical silicone gel is started a few weeks later. Typically, I will then see my patients for at least a year and a half, first starting on a monthly basis, then less frequently if there are absolutely no signs of recurrence. Even after the year and a half period, they are instructed to see me immediately if there is any evidence of regrowth. The following patient of mine underwent such a treatment and postoperative regimen. She presented with a barbell shaped keloid of the right earlobe that was unsightly and occasionally uncomfortable (photo A). 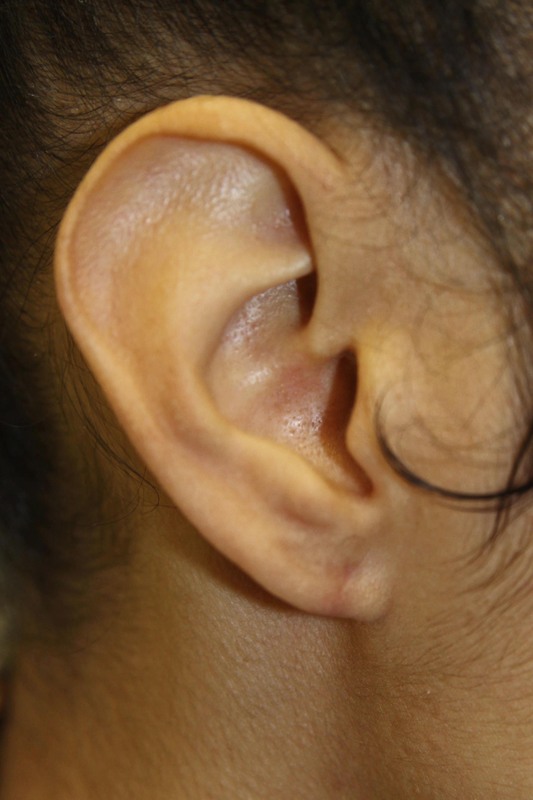 Her treatment, which was performed under local anesthesia, involved surgical excision, reconstruction of the earlobe and injection of a steroid medication into the wound. A silicone scar gel was started 3 weeks later with regular monitoring thereafter (photo B). For more information on the treatment of keloids or for any other plastic surgery procedures that I perform or to schedule your consultation, please call my office at 480-451-3000.